Just when you think you’ve mastered SEO, along comes a new way to search for businesses like yours—and consumers are embracing it. Voice search is still in the early stages, but its growth means some big changes for your business website, social media and other online marketing content. And this is just one of many shifts taking place in the way small businesses market their goods and services. What are the best ways for you to find—and reach the right prospects—and how do they find you? What are the latest marketing challenges—and solutions? How do you keep up? You’ll learn all that and more in this webinar with small business expert Rieva Lesonsky. Retail business has undergone a series of transformations but the biggest change is the one that’s happening right now: more and more retail sales come from the web. The fastest-growing part of e-commerce sales is mobile commerce. Have you made those “modest investments?” Do you know exactly which investment will pay off? Do you know how to set up your website for optimum mobile viewing? What are the best ways to attract mobile shoppers? What do consumers expect from your mobile storefront? How are their shopping behaviors evolving and how can you keep up? You’ll learn all that and more in this webinar with small business expert Rieva Lesonsky. Our most popular webinar topic of 2018 returns, with even more ideas for marketing your small business on a shoestring budget! Marketing is essential for keeping your prospect pipeline full. Unfortunately a lack of time, money or skill often forces small business owners to put marketing on the back burner. In this webinar Barry will do a deep dive into developing and executing a shrewd marketing strategy on a limited budget, and getting the results you want. As your business looks to compete in a world of Tweets, likes, bytes and bits, it gets tougher to make true human connections. In this webinar, Ramon Ray will show you how to leverage the power of digital communications while making vital connections with customers and employees. You'll learn specific tips on how to showcase your business as a human-connected brand. Ramon is a leading expert in building and maximizing personal relationships in a digital world. How do you secure your branch sites? Securely connecting multiple locations can be a huge challenge for businesses. If you have multiple clouds but limited skillsets, bandwidth and budget, it becomes even more complex. 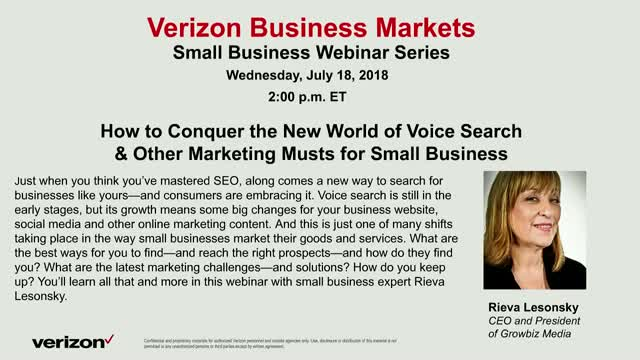 Join our webinar with Verizon VP of Network and Security Product Management, Vickie Lonker, with Versa Networks Director of Marketing, Rob McBride, and Verizon Sr. Product Manager, Anuj Dutia, for a discussion on the future of your branch locations. This panel of experts will explain how Software Defined Secure Branch service provides a single package solution for businesses to securely and rapidly turn up sites in a more simplified way. Register today to see how to enable security, continuity, and innovation for every branch location. Walk away with three key best practices for transitioning to SD WAN. As an added bonus, you will receive Verizon’s new October 2018 report on SD WAN when you attend the session. Are you frustrated with a lack of measurable return from your social media investments? Do you want to turbocharge your results and growth using the latest tools? If you answered yes to either of these questions, this webinar is a must-see. You will learn how to transform your social media investments into high octane marketing that grows your business, instead of sucking time, money and energy with little to nothing in return. You will gain real, actionable insights that you can apply immediately to your business regardless of industry, budget or current following. Don’t miss this chance to participate live and have your own questions answered by Justin Blaney. Traditional sales is good - but it's dead. What works today? Educating customers. In the digital economy much of that education is delivered through social content. In this webinar Technology Evangelist Ramon Ray shares his proven principles for using engaging content to grow sales. Attendees will leave with practical tips for using social content to take their businesses to the next level. Social content marketing takes time, focus and a plan of action to work well - Ramon will help you get there in his simple, energizing and humorous webinar. Why you should put restrictions on your employees' user accounts. New opportunities are opening up as technologies such as artificial intelligence and the Internet of Things go mainstream. But at the same time businesses are under intense pressure to meet changing customer expectations. In this session, learn five key trends that will drive profitability and growth in 2018, if you can quickly leverage them and adapt to them. Anita will explain what these trends mean for your business, with concrete, actionable tips for how to take advantage of these trends in ways that add to your top line and bottom line. Get ahead of the curve and lead in your marketplace, by understanding how to use these trends for growth and profit. You need to hit the ground running in 2018 so now is the time to take a critical look at your business. Do you have a business goal for 2018? Do you have a plan for how you will achieve that goal? Most business owners don't have either. Whether you are just starting out, or you’ve been running your company for decades, you can recharge your goals to achieve success in 2018. In this webinar Brian Moran helps you define customized strategic goals that work for your business so you can sustain long-term growth, starting in 2018. Following up on the highly successful "How to Develop a World-Class Email Advertising Program Without Spending a Fortune" webinar, Willie Pena dives deeper to show you how to super-charge your email marketing efforts while saving time and money. If you want to double or triple your sales leads, this is the webinar to watch! One of the biggest challenges facing small business owners today is attracting and retaining customers and clients. What are the best ways for small business owners to do this? Today's smart business owners are adapting old marketing methods and embracing new ones. In this webinar, we will discuss the best practices, strategies, tips and tactics business owners can use to create loyal customers, including social media best practices, creating killer content and the secrets of email marketing. Free webinars designed to provide small business owners with knowledge and trends to help your business grow.